The e-Pulse® Ultra Standard Bundle is the perfect introduction package for a full body TENS/EMS treatment. Ideal for relieving pain associated with sore and aching muscles in the shoulder, waist, back, upper, and lower extremities.. The e-Pulse® Ultra Standard Bundle is the perfect introduction package for a full body TENS/EMS treatment. Ideal for relieving pain associated with sore and aching muscles in the shoulder, waist, back, upper, and lower extremities. 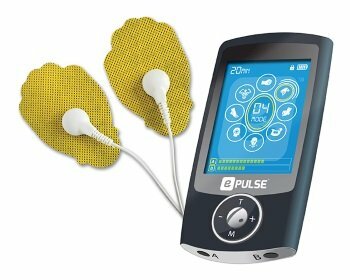 e-Pulse® Ultra is an advanced Neuro Stimulator device that can be used for pain relief anytime, anywhere. The e-Pulse® Massage Shoes provide soothing relief to your feet and body by stimulating all of the acupressure points on your feet. Compatible with all TENS/EMS devices. The e-Pulse® Workout Belt is designed to provide optimum relief to the lower back. It can also exercise and tone abdominal muscles. Compatible with all TENS/EMS devices.